Blackburn's Click USB Rear Light throws 20 lumens from its single LED for ample visibility at night, and it's designed to shine light from the sides as well for visibility to cross traffic. 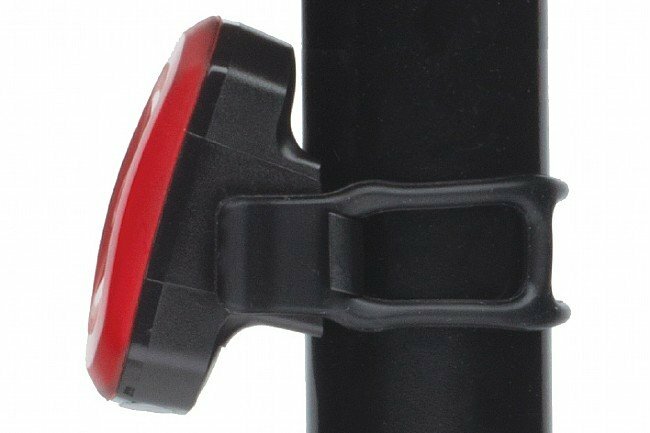 A universal rubber mounting strap is compatible with seatposts and frames 15 mm - 35 mm in diameter, and the integrated Li-Po battery is USB rechargeable in 3 hours using the included cable. Remaining battery life is shown with a built-in indicator. Runs for 1.5 hours on constant and 3 hours on blinking mode. IP65 waterproof rating. Claimed weight is 20 g. Available in multiple colors. Easy to use, very bright, holds a charge well. Thought I'd try a Blackburn product, hell it was a UDB rechargeable for less than $20. My last light was GREAT, a bit pricey but never failed and lasted 5 hrs on century rides (Broke the red cover plate, self inflicted !). Turning this OFF was next to impossible, Push it, it would switch from flash mode toon but never to off, well almost never, A N D is did not last more that 2 hrs (flash mode) on a FULL charge. I need to as for my $$$ back! BTD should be ashamed of themselves for selling a POS like this.